Devil’s Cape was a bit like the recent birth of my daughter: lots of set-up followed by a mad dash toward the finish line followed by a feeling of satisfaction. Yes it’s an oversimplification of what new fatherhood feels like, but I’m not working on a lot of sleep here. Rob Rogers’ first novel is a fascinating look at superheroics in a real world setting (and I realize how trite that idea is these days). He sets his epic in Devil’s Cape, a pretty crappily named city that might as well be New Orleans. It’s a tale of burgeoning heroes in a city where heroes don’t last long and where villains, especially the super powered kind, flourish. It’s obvious Rogers has put a lot of thought into the world he has created. There’s a map of the city at the front of the book, and the slow ramp up to the fisticuffs feels less like a tedious history lesson and more like the tease before a big show. Readers get a full picture of what Devil’s Cape is like and what it means to be a force for good or evil in the city, and it’s that type of world building that can and, if the ending is indication, will lead to a series of stories I look forward to reading. The book isn’t without flaws, of course. The set up is a bit too long and I think the book would’ve benefitted from culling 30 or so pages. The rush to the end really is a rush in that the climax is over in the last 20 or so pages, and that’s really not giving the finale the attention it deserved. 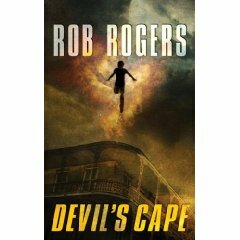 There are few sections that feel over written where Rogers tends to fall in love with his descriptions of Devil’s Cape, but you can forgive a first time author that transgression. In the end, I truly enjoyed my time spent reading this book. I liked it enough to think that I never really gave it a fair shake since I couldn’t read more than 20 or so pages at a time. Plus, it will always have a positive connection to my life since I finished it while sitting in the delivery room, waiting for the labor-inducing drugs to take effect. This entry was posted on July 27, 2008 at 2:39 pm and is filed under Uncategorized. You can follow any responses to this entry through the RSS 2.0 feed. You can leave a response, or trackback from your own site. That is odd. Though, I must say that my eye goes to the title pretty quick. Not sure if it is the italics, the yellow or perhaps that the guy jumping (falling?) downwards helps too. The cover image is fantastic. Not a big fan of the font for the title or author. Looks cheap or something. That image of the cover looks very good, but unfortunately the physical book doesn’t live up to that. It’s muddy and somewhat unappealing, even given the striking visual of someone flying on wings of flame (which never happens in the book). It’s a cheap book, there’s no doubt about that. It’s from a publisher I haven’t heard of, and the paper stock is easily mutilated.